The Palestine Liberation Organization (PLO) terrorist organization on Wednesday said an EU decision to label Jewish goods from Judea, Samaria, the Golan Heights and eastern Jerusalem was a "positive step" but did not go far enough. "EU labeling of settlement products is a step in the right direction but insufficient," the PLO's negotiations affairs department said on Twitter. "Products of a war crime must be banned not just labeled." 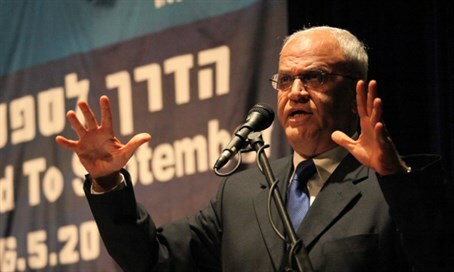 PLO secretary-general Saeb Erekat also welcomed the decision, calling it a "significant move toward a total boycott of Israeli settlements, which are built illegally on occupied Palestinian lands." His comment confirms the assessment of experts who told Arutz Sheva on Wednesday that the move is merely the first stage towards a total boycott of all Israeli products. "We believe that more actions are necessary to hold Israel accountable for the crimes it continues to commit against the land and people of Palestine," he said in a statement, which ironically comes in the midst of a terror wave being incited by the Palestinian Authority (PA). Despite Erekat's claims, Israel's presence in Judea and Samaria and elsewhere over the 1949 Armistice line is in fact legal according to international law, as proven by the 2012 Levy Report. While the report was commissioned by Prime Minister Binyamin Netanyahu, two consecutive governments led by him have yet to adopt the findings.